Expenzing's Procure to Pay Software helps to automate the Purchase to Pay process saving time and efforts required for procurement and helping the organization make better and faster purchases. Work for Expenzing Procure To Pay Software? Learning about Expenzing Procure To Pay Software? What Purchasing solution do you use? Coupa's Procure-to-Pay solution covers all the steps from Procurement to Invoicing including RFQs, Contracts, Requisitions & POs, Budgets, Invoicing and Inventory Management. 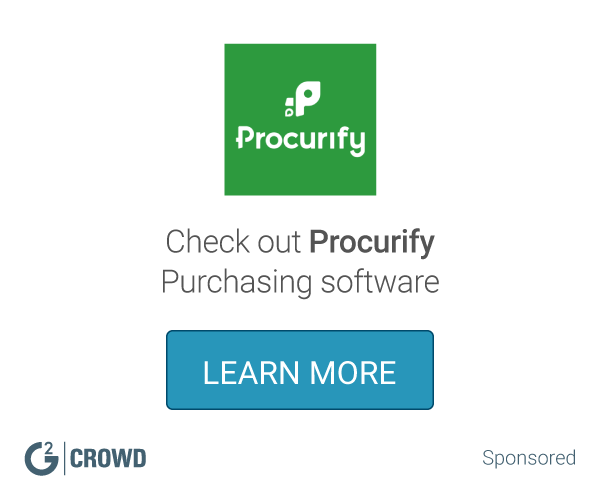 Procurify is an evolution of Purchasing Software. Easy-to-use features, you get the cost management capabilities you need to save on purchasing. Eyvo eBuyerAssist Platform is a SaaS procurement solution designed to integrate with accounting and ERP systems, modular design, flexible approval setup, affordable. ProcurementExpress.com gives manager-types and road warriors total control over project spend, all from your inbox. (That means no hassling with yet another login.) And your team gets quicker approval for the resources they need to keep the ball rolling. It takes just minutes to set up, and we'll do most of the work. EZGovOpps is a federal government procurement tool specifically designed for government contractors, capture managers, business developers, proposal writers, and government researchers. Seamlessly allocate spending and track purchases without paperwork or receipts. Zycus eProcurement Performance solution empowers procurement professionals to source both simple and complex categories with ease. eBuy is a cloud eProcurement application that allows requisitioners and professional buyers to perform online buying and carry out procurement processes from procure to pay. Xeeva provides next generation solutions of intelligent procurement and financial. * We monitor all Expenzing Procure To Pay Software reviews to prevent fraudulent reviews and keep review quality high. We do not post reviews by company employees or direct competitors. Validated reviews require the user to submit a screenshot of the product containing their user ID, in order to verify a user is an actual user of the product. Hi there! Are you looking to implement a solution like Expenzing Procure To Pay Software?